Benin Mwangi started up the Carnival of African Enterprising a couple months ago. It is hosted at a different blog or news site each month, and features the best of the blogging world’s articles on African business and entrepreneurship. Take a look at the activity behind the first two – first at African Path (June 6), and currently at AfricanLoft (July 6). The August Carnival will be held here at White African on August 6th. 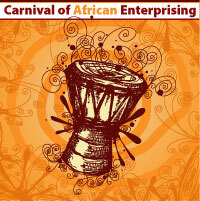 Please take the time to submit your best article to the Carnival of African Enterprising by the end of this month. There’s nothing like getting on a Blog Carnival to become part of the discussion and get more people noticing you. If you would like to host a future Carnival, contact Benin Mwangi and he’ll set you up with a date. hi could you send me the article on madi inyinya. John, I’m not sure which article you’re referring to actually. Use the contact form to email me if you can, to give me a better idea.